In 2013 when Map-21 took affect raising the bond requirement from $10,000 to the current $75,000, most sureties withdrew from writing this bond. The fact that there was a high loss rate at the $10,000 level made the prospect of loss at $75,000 too great to risk. Two of our most experienced markets marched on through the increase. Given their years of experience with this bond and claims knowledge they have been able to consistently offer the BMC-84. With excellent and knowledgeable claims handling, stable and sustainable rates; these are our preferred markets to offer. In the last few years a couple of new sureties have entered the market. The results have been the lowering of rates, particularly for certain applicant profiles (typically the middle tier applicant). Those with good credit have additional options. 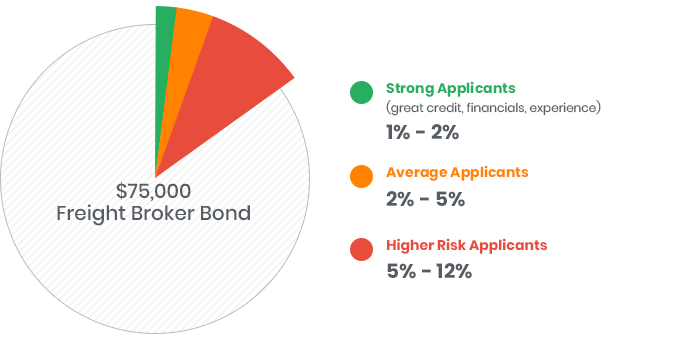 If these applicants are able to submit financials and/or a resume they may be able to find lower rates then our credit only markets as these items give the underwriter a fuller picture of the applicants’ strength. If you want to learn how you can lower your freight broker bond cost, chech out the video below. To learn more about what freight broker bonds are and how do they work, visit our Freight Broker Bond page.